Here’s Paul Taylor’s take on the Avid outing to Minehead from the U12’s perspective. 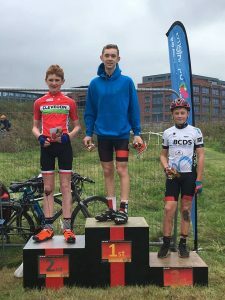 “Tom took a break from CX this weekend to race at the Minehead festival of cycling on a superb 1.1km street circuit within the seaside town centre. With a forecast of rain we were expecting a sketchy race but the weather held although drama came from another direction! 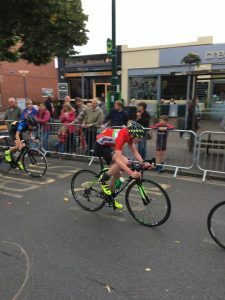 “The start was superfast and Tom was caught on the back foot whilst trying to clip-in but got back on to the lead group going into the second lap. With the guys pushing a hard pace the bunch was whittled down to five riders going into the final lap where Tom positioned himself in second wheel. Unbeknown to the leading riders a barrier had fallen over behind them into the path of one of the young riders who was catapulted over the handlebars. By now the leading bunch were at full gas and Tom made an early attack giving himself a significant lead up to the finish line with certain victory in his grasp. The following weekend, the riders were back in action, this time on the grass at ShamXross in the Western Cyclocross League. Here are the thoughts of Martin Harris as Jenson took Avid Sport’s first ever victory! “Well what can I say? If Carlsberg did local Cyclocross… This would be it. Each time we visit Keynsham for Cyclocross, Salt & Sham (SAS) cycle club manage to raise the bar that little bit higher. 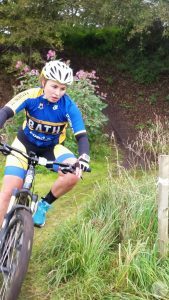 “Our 1st trip to Somerdale was approximately 18 months ago for the schools’ Cyclocross. The course had been built from scratch. Back then the long grass, though cut and raked, was challenging. I’m pretty sure that afternoon, we had children’s bikes with broken hangers and mangled derailleurs. “Since then, the course has been used for a round each of the Western League’s Winter and Summer CX and this was the 2nd time for the Winter CX. The course goes from strength to strength and never disappoints. The effort and time put in to this venue is clear to see and is testament to how dedicated the SAS recruited volunteers are to give other riders the best racing experience they can. “This winter round saw the addition of 2 new banked sections and the addition of a Sandpit! The Sandpit that would later prove to be the source of much entertainment for the baying crowds. It seems to be human nature that people like to celebrate other people’s miss-fortunes and the sandpit would be a regular source of ooohs and aaaaahs as the riders pitted themselves against the sand-trap. “As per previous visits there was the spiral of doom and I’m sure this grows in size from round to round. “The atmosphere was amazing. The music, the crowds cheering and the ringing of cowbells was constant. The air was filled with the smell of fresh Burgers and Hot dogs. The Coffee flowed, the crowds remained to support throughout the day and from the youngest of Children, to the most mature of riders; the racing was fierce. Everyone gave their all. “The Avid Sport riders, put in some strong performances; on the bounce from the Minehead Crits. Felix: Jenson and Tom rode superbly to lock out the top two spots in the U14 race. It was great to see so many of the team racing, with Sam Butters in the U16 race, Harry Tucker in the Juniors and Molly Hodges racing her first cross race in the women’s race. Well done to all! “This has no doubt helped cement a great foundation, on which to build their future… This is a team that’s going places! “A massive ‘thank you’ to Salt and Sham for their tireless efforts; to provide what has to be one of thee best local races in the South.